The Partagas Serie D No.6 is a beautiful Petit Robusto, 3.5” (90mm) long, of 50 ring gauge, and comes in 5 packs of 5 cigars. Released at the 2014 Habanos Festival, they are the shortest cigar in the Partagas line. Very similar to the Partagas Serie D No.4 or to the D No.5, they share the same ring gauge. It is a powerful short smoke, however not as strong as the No. 4, which has the typical Partagas flavors, such as coffee, wood, vanilla, rich and strong tobacco and a good zing of pepper at times. Very good construction on this short cigar, this is a go-to cigar for a fan of the Partagas Serie D No.4 and when time is of the essence, especially in the winter. The average smoking time is about 20 - 30 minutes. The Partagas Serie D No.6 is a very good option for a strong cigar and when the time is of the essence. 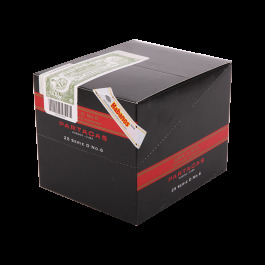 • Typical Partagas flavors: coffee, wood, strong tobacco, cocoa and pepper. • Beautiful construction, perfect draw and sharp burn. 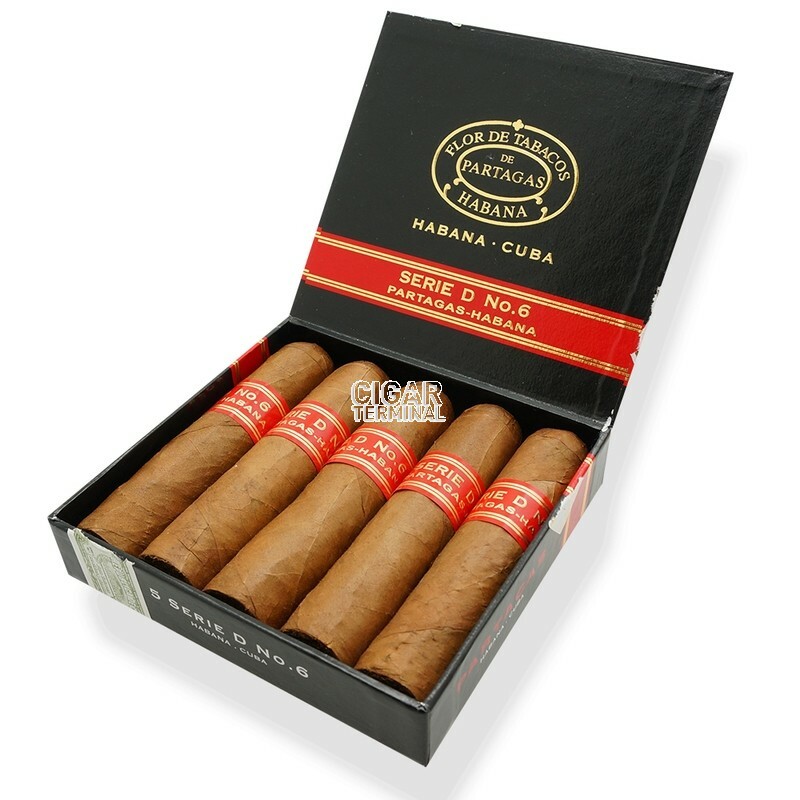 This cigar is made for fans of the Partagas Serie D No.4 who are short in time. The cigar is looking great; it has a beautiful colorado claro medium-brown, color. The wrapper is smooth, almost veinless, and slightly oily. The triple cap is almost perfect. The cigar is firm without any soft spot. Like its older sibling, Partagas Serie D No. 4's, the box gives out cedary and honey creamy scents. The pre-light draw is perfect and the wrapper leaves a sweet flavor on the lips.The cold draw is easy, not too easy though, and gives typical Partagas flavors, tobacco, earthy tones and also some sweetness. The burn line might start a bit uneven at the beginning, but then corrects itself. Creates a nice medium grey ash, which holds on for almost the half of the cigar. A generous amount of smoke is released by this cigar. The cigar starts off with lots of pepper, but after a couple of puffs, the pepper fades and leaves ample space for a good tobacco flavor. There is also plenty of coffee, cocoa and some notes of leather, wood and earth. The finish is long and woody. In the final third, the harshness goes away, but the flavors get stronger, now a full body cigar. The flavors are full of wood and black pepper. In summary, it is a very powerful short smoke, which is pretty much as shorter version of the Partagas Serie D No.4, perfect of a short break or a winter smoke.